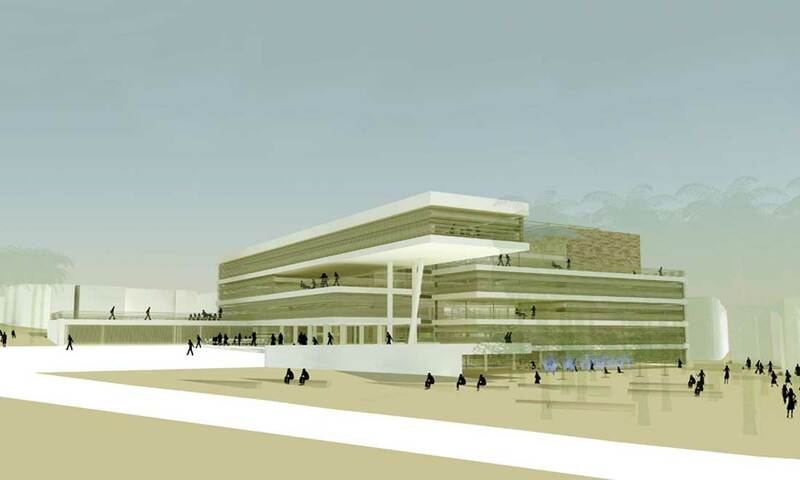 COMPETITION FINALIST AT A NATIONAL COMPETITION CONDUCTED BY EYLAT'S MUNICIPALITY AND THE ASSOCIATION OF ISRAELI ARCHITECTS. 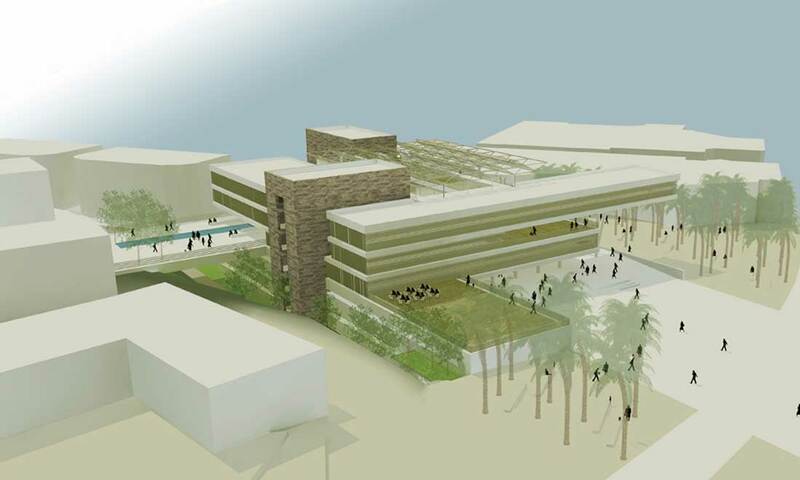 THE NEW CITY HALL OF EILAT WILL BE A SIGNIFICANT MARK POINT IN THE CITY, AN AREAL ICON AND A GENERATOR OF URBAN HAPPENING. 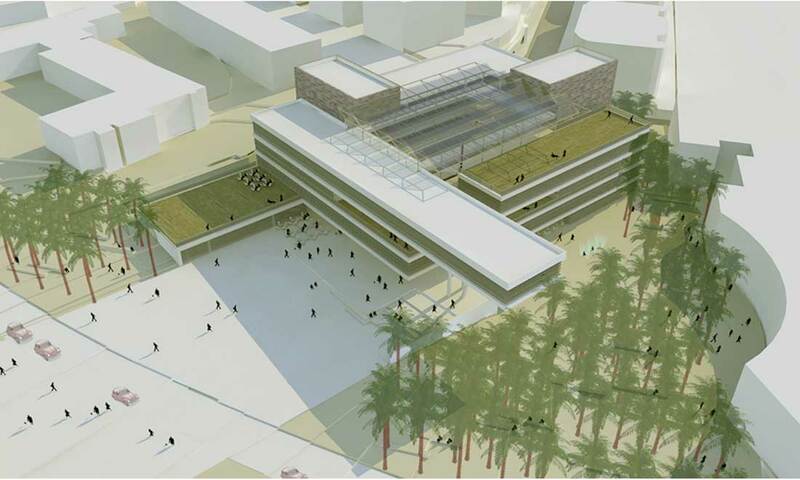 THE NEW BUILDING DERIVES FROM THE EXISTING URBAN TISSUE, INTERPRETS IT, REVIVES AND STRENGTHENS THE CITY CENTER. THE NEW BUILDING ACTS AS A JOINT TO THE DIFFERENT CITY LEVELS, WHICH APPLY A CONNECTION BETWEEN THE MOUNTAIN AND SEA, BETWEEN LOCALS AND TOURISTS, LEISURE AND TRADE, EVERYDAY AND FESTIVE DAY. 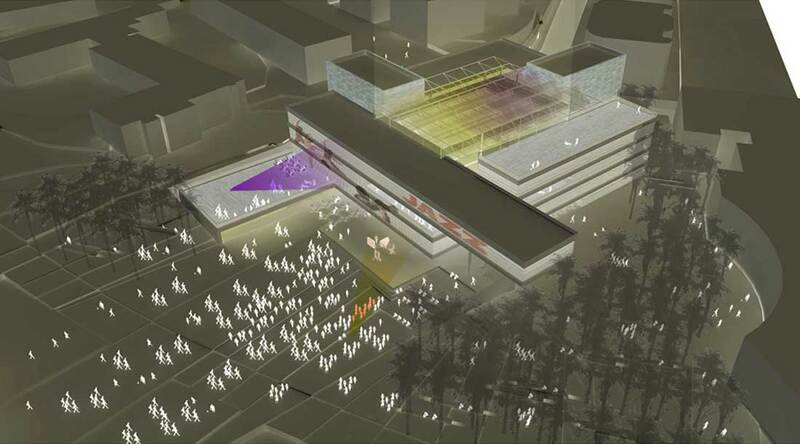 THE NEW CITY HALL USES THE TOPOGRAPHIC DIFFERENCES OF THE SITE TO CREATE THREE PLAZAS – THREE DIFFERENT PLATFORMS FOR CITY HAPPENINGS: THE TRADE PLAZA, ON THE LOWER LEVEL: A SHADED SPACE FOR EVERYDAY USE DEFINED BY THE NEW BUILDINGS’ COMMERCIAL FUNCTIONS AND THE EXISTING COMMERCIAL CENTER. 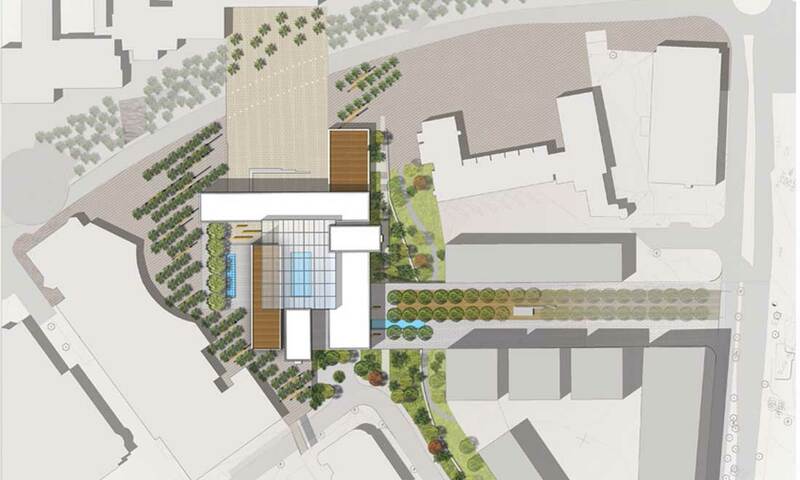 THE CITY PLAZA, ON THE MID LEVEL: A MULTIFUNCTIONAL OPEN SPACE, WHICH ACTS AS THE DAILY MAIN ENTRANCE TO THE CITY HALL. WHEN CITY FESTIVALS ARE HAPPENING, THE PLAZA CAN WIDEN TO THE OTHER SIDE OF TMARIM BOULEVARD AND ACT AS AN EXTRA SIZE PIAZZA FOR PUBLIC EVENTS. THE ‘CITY PLATFORMS’ MEET THE BUILDINGS’ CORE, THE HEART OF THE PROJECT: THE CORE PROVIDES THE PHYSICAL CONNECTION BETWEEN THE DIFFERENT MUNICIPAL FUNCTIONS. 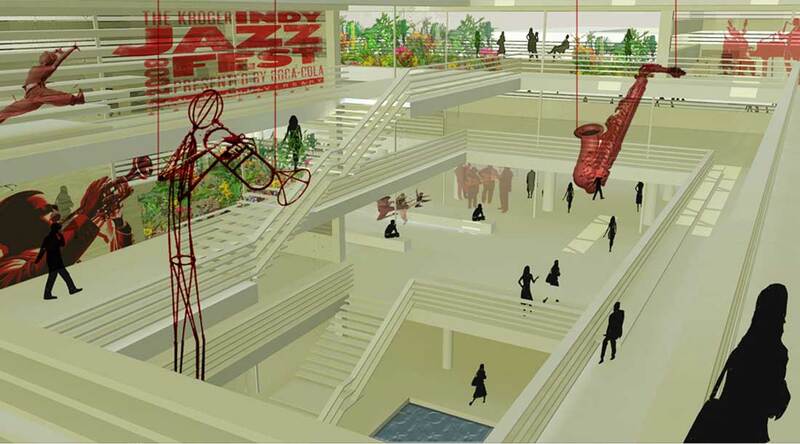 THE CENTRAL SPACE ORGANIZES THE STRUCTURE AROUND IT IN A WAY THAT PROVIDES FLEXIBLE AND GRADUAL PLANNING OF THE BUILDING. THE CORE HAS AN INTEGRAL ROLE IN THE ENERGY-SAVING SYSTEM OF THE BUILDING. FOR THE PUBLIC THE CORE SERVES AS AN INTERNAL CHILLED COURT. WITH ITS’ LIVELY AND VARIABLE NATURE IT IS THE CULTURE-METER OF THE CITY. THE STRUCTURE, ORGANIZED AROUND THE CORE, IS COMPOSED OF THREE MAIN ELEMENTS: LOCAL STONE PRISMS – PROVIDE THE VERTICAL MOVEMENT, AND SERVICE FUNCTIONS. HORIZONTAL CONCRETE SURFACES – ACT AS PLATFORMS FOR THE DIFFERENT ACTIVITIES, INTERNAL AND EXTERNAL. MODULAR BOXES – CONTAIN THE MUNICIPALITY AND GOVERNMENT OFFICES. THEY ARE INSERTED BETWEEN THE HORIZONTAL SURFACES, AS A GROWING BUILDING, ACCORDING TO THE BUILDING STAGE.